Moroccan Oil seems to be the new thing lately, but it is quite pricey. 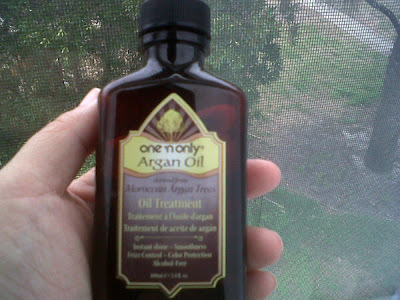 I have seen it go for $30 for the same size bottle as this Argan oil which retails for $9.50. I decided that the Argan oil would be a friendlier alternative for my wallet. Details: An oil treatment that is used to protect hair from environmental and heat damage as well as to revitalize and nourish fry and damaged hair. This product also claims to add shine and help to eliminate frizz. The bottle that I purchased is 3.4 oz. Where to buy: I purchased mine at Sally Beauty Supply for about $9.50. How to use it: I take a quarter size of this prodcut (I have long, thick hair) and smooth it through my hair after my shower. I also use it on dry hair before I straighten it. My thoughts: I am in love with this product. This is a quick step that I can add to my hair routine and I am able to use it on wet or dry hair. I have seen a significant improvement in my hair in terms of look and feel. My hair is naturally unruly, curly, and a bit coarse to the touch. After using the Argan Oil I have noticed that my hair feels softer, looks less frizzy, looks shinier, and it looks healthier overall. I would give this product A+. I can't compare this to the Moroccan oil, I'm sure it is a fantastic product but the Argan oil works great for me. I love the way this makes my hair look and feel and it is a great value for your money because you need the smallest amount. What do you all think? Have you tried Argan Oil and what were your results?